Twelve U.S., as well as eight international, journalists have been awarded fellowships to pursue proposals for journalism innovation during the 2015-16 academic year. How do we engage Brazil’s emerging middle class? Can we leverage technology to empower women in newsrooms? What can we do to support the growing field of professional media freelancers? These are just a few of the questions the newest cohort of fellows hopes to address as part of Stanford University’s John S. Knight Journalism Fellowship program. 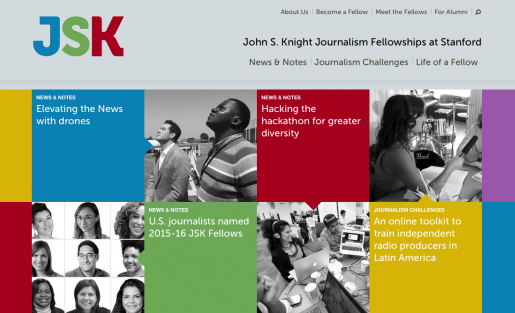 Twelve U.S. and eight international journalists have been awarded JSK Fellowships to pursue proposals for journalism innovation during the 2015-16 academic year. Now in its 50th year, the JSK Fellowship program supports innovation, entrepreneurship, and leadership in journalism by helping fellows address their “journalism challenges.” Each year, it gives 20 individuals from around the world the resources to test their ideas for improving the quality of news and information reaching the public. Fellows advance these ideas not only through collaboration with each other, but also with Stanford faculty, students, and the Silicon Valley community. The new U.S. and international fellows, as well as their ‘journalism challenges,’ are listed below. Sarah Alvarez, senior producer and reporter, Michigan Radio, Ann Arbor, Mich.
How do we fill the information gaps faced by low-income news consumers? Susan Cagle, independent reporter and illustrator, Oakland, Calif.
How can we better support the growing field of professional media freelancers? Jenée Desmond-Harris, staff writer, Vox.com, Washington, D.C.
How can we translate academic insights about race and racism into conversation-changing journalism? Jacob Fenton, editorial engineer, Sunlight Foundation, Washington, D.C.
How can we build free tools to help reporters extract data from scanned forms? Liz Gannes, senior editor, Re/code, San Francisco, Calif.
How can we create a location-based platform for distributing news, tying stories to where they took place? Aaron Glantz, veterans reporter, The Center for Investigative Reporting, Emeryville, Calif.
How can we develop a new strategy to engage newsrooms in exposing the effects of war on the home front? Tonya Mosley, broadcast contributor, Al Jazeera America, Seattle, Wash.
How can local television news stations establish and maintain consistent and meaningful engagement with audiences? Kristen Muller, senior managing editor, Southern California Public Radio, Los Angeles, Calif.
How can public radio leverage its audience to take a more proactive role during crises? Tracie Powell, founder and editor, All Digitocracy, Washington, D.C.
How can we make newsrooms more diverse and connect with increasingly diverse audiences? Naomi Starkman, founder and editor-in-chief, Civil Eats, Sonoma County, Calif.
How can we make food policy news part of our daily media diet? Matilde Suescun, director, digital, community empowerment initiatives, Univision, Miami, Fla.
How can we develop a narrative about education on mobile devices for Spanish-speaking Hispanics? Craig Timberg, national technology reporter, the Washington Post, Washington, D.C.
How can we put foreign correspondence on sound financial footing in a digital news marketplace? How can we implement new business models to sustain independent media in developing markets? How can we develop a journalist-centered innovation model to promote entrepreneurship and sustainable new media under adverse political and economic conditions? How can professional journalism be conducted in regimes with deterrent political, security and socio-economic conditions? How can we structure news organizations to support continual innovation and restore the influence of professional media in the Internet Age? How can we use technology to empower women in newsrooms to take on leadership positions? How can we create a program specifically tailored to journalists and media in Australia to encourage investment in new media and embed innovation in journalism? How can digital media engage Brazil’s emerging middle class with the news? How can city newsrooms systematically track and capture data from complex issues independent of reporters’ efforts? Meg Dalton (@megdalts) is the associate editor of PBS MediaShift and Idea Lab.